Difference between revisions of "Performance 2007"
On February 10th, 2007, [[Nine Inch Nails]] began touring for the first time since July, 2006, starting in Lisbon, Portugal. These shows would feature at least one song that has never been played live before, or has rarely been played live in recent years. During the Spanish and UK legs at the beginning of this tour, flash drives each containing an intentionally leaked song from ''[[Year Zero]]'' ("[[My Violent Heart]]," "[[Me, I'm Not]]" and "[[In This Twilight]]") have been found in men's bathroom stalls. Two months before the release of their fifth full-length album, ''[[Year Zero]]'', [[Nine Inch Nails]] began a new tour, officially called '''Performance 2007'''. The tour started as a kind of best hits tour (since no songs from ''Year Zero'' were played at the first few days) but later trasformed into direct ''Year Zero'' support tour. Prior to the beginning of tour Reznor in interview described it as an opportunity of playing with the same line-up again, visiting some places NIN did not played in before and revisiting music from all the different areas of NIN rather than focusing on the new album. Two ''Year Zero'' songs made their debut on this leg ("[[Survivalism]]" and "[[The Beginning Of The End]]"), as well as a few old, never before played live songs: "[[Last]]" from ''[[Broken]]'', "[[We're In This Together (song)|We're In This Together]]" from ''[[The Fragile (halo)|The Fragile]]'' and deconstructed version of "[[The Fragile (song)|The Fragile]]" from ''[[Still]]''. Three songs from ''[[The Downward Spiral (halo)|The Downward Spiral]]'' ("[[Heresy]]", "[[Ruiner]]", "[[The Becoming]]") returned to the setlist for the first time since 1994-95 [[Self Destruct Touring Cycle|Self Destruct tour]]. The production on this tour was minimal, as it was mostly club tour. On the other hand, the tour featured a haviest setlist rotation in NIN history, covering about 40 songs from all NIN albums. During the Spanish and UK legs at the beginning of this tour, flash drives each containing an intentionally leaked song from ''Year Zero'' ("[[My Violent Heart]]," "[[Me, I'm Not]]" and "[[In This Twilight]]") have been found in men's bathroom stalls. This tour featured the same production as previous European tour, but was more focused on ''Year Zero'', as it had 5-6 ''Year Zero'' songs in each show setlist, while European tour had no more than two. ''"[[Hyperpower! ]]"'', "[[The Good Soldier]]", "Me, I'm Not" and "[[Capital G (song)|Capital G]]" made their live debut on this leg. This tour featured one more song from ''Year Zero'' ("[[The Great Destroyer]]") and more extensive production, which included a traditional for major NIN tours visual section in the middle of show, this time created for "Me, I'm Not", "The Great Destroyer", "[[Eraser]]" and "[[Only (song)|Only]]". 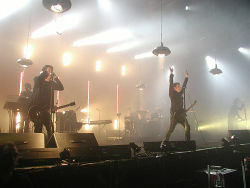 Two months before the release of their fifth full-length album, Year Zero, Nine Inch Nails began a new tour, officially called Performance 2007. The tour started as a kind of best hits tour (since no songs from Year Zero were played at the first few days) but later trasformed into direct Year Zero support tour. During the Spanish and UK legs at the beginning of this tour, flash drives each containing an intentionally leaked song from Year Zero ("My Violent Heart," "Me, I'm Not" and "In This Twilight") have been found in men's bathroom stalls. This tour featured the same production as previous European tour, but was more focused on Year Zero, as it had 5-6 Year Zero songs in each show setlist, while European tour had no more than two. "Hyperpower! ", "The Good Soldier", "Me, I'm Not" and "Capital G" made their live debut on this leg.